Have you ever been ashamed of some failure, of some sin, or of some habit you cannot break? As we saw last week, we keep those things hidden in the closet of our lives and we need to let Jesus in that closet to clean it and to heal us. Speaking of Jesus, have you ever been ashamed of Him, of carrying your Bible, of going to church, or of speaking for Christ? I’m asking this to Christians, because in order to be ashamed of Jesus you have to claim belief in Him. How could someone that does not claim to be a Christian be ashamed of someone they do not believe in? When I first became a Christian, I determined to keep my faith to myself because I didn’t want to lose my friends or offend my family and coworkers. Then I read what Jesus said and He changed my mind. 1. By word: Peter is our classic example of verbal denial in Mathew 26:69-75 Now Peter sat outside in the courtyard. And a servant girl came to him, saying, "You also were with Jesus of Galilee." But he denied it before them all, saying, "I do not know what you are saying." And when he had gone out to the gateway, another girl saw him and said to those who were there, "This fellow also was with Jesus of Nazareth." But again he denied with an oath, "I do not know the Man!" And a little later those who stood by came up and said to Peter, "Surely you also are one of them, for your speech betrays you." Then he began to curse and swear, saying, "I do not know the Man!" Immediately a rooster crowed. And Peter remembered the word of Jesus who had said to him, "Before the rooster crows, you will deny Me three times." So he went out and wept bitterly. 2. By action: Our actions speak louder than our words. We may tell others we believe in Christ, but if we don’t act like we believe Jesus, others will not take our faith nor Jesus Christ seriously. Since we don’t act seriously about following Christ, we deny our faith in Him. 3. By silence: We keep our faith to ourselves and don’t speak about it. In other words, we are a closet Christian. As I mentioned last week, God wants us to get rid of the sinful stuff in the closet of our lives. In addition to that, God wants us to come out of the closet, to declare our faith openly to the world. 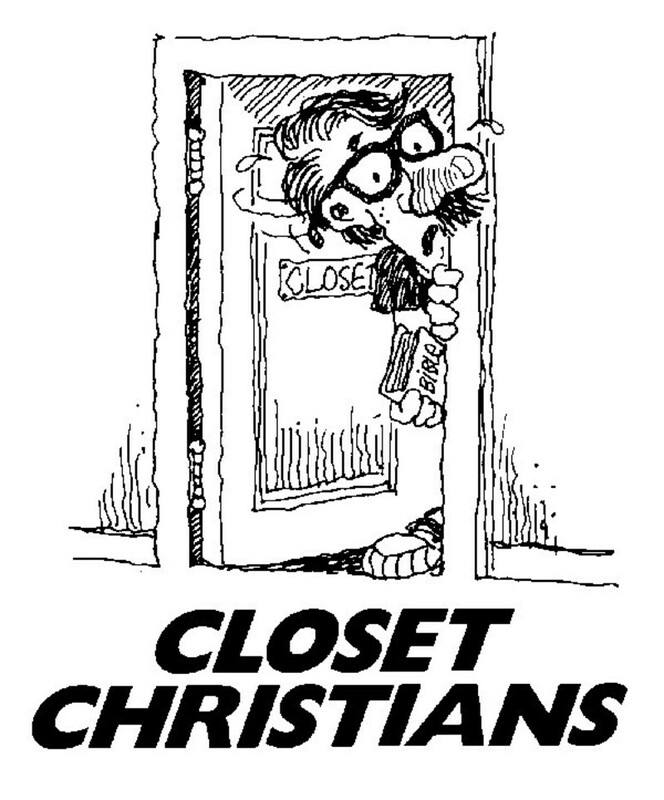 Why do Christians stay in the closet? Fear is the main reason: fear of ridicule, persecution, embarrassment, of being ostracized, of losing that promotion. Paul wasn’t ashamed of the Gospel even though he suffered much for sharing it with everyone. He was imprisoned in Philippi, chased out of Thessalonica, stoned in Lystra, smuggled out of Berea, laughed at in Athens, and told by the citizens of Corinth that his message was foolishness. And after all this, why didn’t he quit sharing and become a closet Christian? Because, Paul knew the Gospel was not his message. It came from the King of kings! And it is the power of God! You can’t get any higher or more powerful than that! The Gospel is just as powerful today as it was when it was first preached. The Holy Spirit gives it power and anoints it. The people it produces are people of power. Jesus said in Acts 1:8 But you will receive power when the Holy Spirit comes upon you, and you will be my witnesses in Jerusalem and in all Judea and Samaria, and to the end of the earth. 2 Timothy 1:7 for God hath not given us a spirit not of fear but of power and love and of a sound mind. As Paul stated, salvation is the effect or outcome of the presentation of this powerful Gospel for EVERYONE who believes. Believing means, “Betting your soul that God is real and that what He has said and done is true.” Consequently, if you believe it, you act on it and live by it. So, Christians, if we really believe the Gospel has this power to save people from Hell, why are we ashamed of the Gospel? Why be ashamed of something that has the ability to influence and even transform the human heart? It is what the world needs! This man was so thankful for his eyesight that he just had to tell others so they could be helped. Why don’t we have the same courage, conviction, and boldness to tell the spiritually blind how they can receive their “sight” and be saved from eternal damnation? Ah, there is the problem! Jesus told us that if we follow Him, we will be treated like He was treated. Yes, we will suffer if we come out of the closet and share the Gospel. So to escape a little suffering here, we let people go to eternal Hell, without knowing how they can escape. How unloving and selfish! We are supposed to be Christ’s ambassadors! We can come into this building and get inspired being around others who know Jesus. We can talk about the Lord, share testimonies of what God is doing in our lives, sing, and get excited about the things of God. It is a safe place here, but it is not to become a closet. This is a place to get prepared go forth as Christ’s ambassadors, because our faith becomes controversial as soon as we walk outside the doors and step onto the streets. It is not a modern problem, it has been a problem ever since Jesus came to this world. In Acts 4, the new believers in Jesus were gathered safely in the Upper Room and in their homes. Then Peter and John took the message of Jesus and the Resurrection into the streets of Jerusalem. A lame beggar was healed by the power of Jesus’ Name and a crowd gathered. Peter told them about Jesus. As a result, Peter and John were arrested and put in jail. The next day an inquiry convened and Peter continued to testify to the rulers and priests about Jesus as the Messiah and His resurrection. He spoke with power and authority. Acts 4:13 When they saw the courage of Peter and John, and realized that they were unschooled, ordinary men, they were astonished and they took note that these men had been with Jesus. Here is Peter, who earlier denied Christ when Jesus was arrested. At that time, he ran deep into his closet after someone asked if he had been associated with Jesus. But now, three months later, he is boldly claiming to know Jesus Christ and proclaiming the Gospel in spite of being threatened, arrested, and imprisoned. What made the difference? Do you see the difference? Peter was filled with the Holy Spirit. There are a lot of people in the church who have the Holy Spirit, but they don’t show evidence that they are filled with the Holy Spirit. How can we say that? The fruit of the Holy Spirit is the evidence of being filled with the Spirit. Also, the Holy Spirit empowers those who belong to Christ to crucify their fleshly passions and desires. The presence of the Holy Spirit is how Christians are recognized. They cannot hide God’s presence in their life if they are full of the Holy Spirit. People will recognize they have been with Jesus. That is how the Holy Spirit gives Christians the power to be Christ’s witness and ambassador. And that is why we are commanded to be filled with the Holy Spirit. Those who are filled with the Holy Spirit also have a passionate commitment to God’s Truth. They talk about it and live by it. Sadly, Truth is not popular in America today. Truth is out; tolerance and compromise is in. That is why the true church is unpopular. And if we are filled with the Holy Spirit and committed to Truth, we are not going to be popular. It was no different when Peter and John lived. The people were upset by the Truth then, just as people are upset by the Truth today. Acts 4:1-3 And as they were speaking to the people, the priests and the captain of the temple and the Sadducees came upon them, greatly annoyed because they were teaching the people and proclaiming in Jesus the resurrection from the dead. And they arrested them and put them in custody until the next day, for it was already evening. What made these people so annoyed? It was because Peter and John were courageously passionate about the Truth. Specifically, the Truth that Jesus is the Messiah and is resurrected from the grave. If you start out with a Truth such as that, it is controversial because it requires a response. Will you believe or reject the Truth? Your decision has eternal consequences. Just like today, Peter and John were told that they can be spiritual but not to talk about Jesus. Be tolerant and don’t claim to represent the Truth. Speak, but don’t speak about Jesus being the Christ. Pray, but don’t pray publicly in the Name of Jesus. Peter and John told the leaders, they could not help but speak about what they had witnessed. A witness for Christ has a passionate commitment to tell the Truth, the whole Truth, and nothing but the Truth, so help me God. A witness for Christ cannot stay in the closet because he knows the Gospel is true and he has a responsibility to share it, so others can be saved from Hell. He is empowered by the Holy Spirit with a testimony of reconciliation with God through faith in Jesus Christ. If we are going to follow Jesus, there is no closet to hide in. There is no middle road of compromise. If we are following Jesus, we are always going to be in trouble with the politically correct in our society. 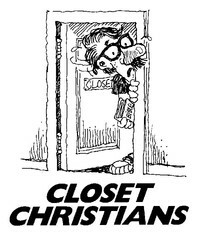 It cannot be avoided unless we deny Christ by staying in the closet. Those who are serious about their faith will always annoy unbelievers. They unintentionally annoy unbelievers because of this passionate commitment to tell the Truth and live according to the Truth. Since unbelievers have no power over believers, they persecute them. Peter and John were threatened, but threats have no effect on a serious follower of Christ. You can beat real Christians, you can terrorize them, you can call them names, lock them up in jail, but you cannot shut them up. After Peter and John were released and they shared with their home church group what happened. Then they prayed. Now if some of us were threatened, how would we pray? “Oh Lord, don’t let anything happen to us. Keep us safe in our closets.” That is what the world and Satan want us to do. Acts 4:29-31 Now, Lord, look on their threats, and grant to Your servants that with all boldness they may speak Your word, by stretching out Your hand to heal, and that signs and wonders may be done through the name of Your holy Servant Jesus." And when they had prayed, the place where they were assembled together was shaken; and they were all filled with the Holy Spirit, and they spoke the word of God with boldness. Oh, that the Lord would shake this place and fill us with the Holy Spirit so that we would come out of our closets, speak the Word of God with boldness, and not be ashamed to suffer for the Name of Jesus in this sinful world! The day of the Messiah’s glory is coming; a day when His glory will be revealed to all. Even those without faith will know on that Day that Jesus is Lord. With that Day of Glory will also come a Day of Judgment! This will be a Day of shame and of being ashamed. All, who have spent their lives being ashamed of Jesus, will feel shame where it really counts, before God Himself. When this Day comes, we will see Christ standing at the right hand of the Father, and He will be ashamed of the person that was ashamed of Him. Luke 9:26 For whoever is ashamed of me and my words, of him will the Son of Man be ashamed when he comes in his glory and the glory of the Father and of the holy angels. Some of you may be sitting here thinking I have laid a burden on you today. If that is the case, I am sorry. I’m sorry that you are ashamed of Christ. There is a part of you where Jesus is not Lord. There is a part of you that still desires the acceptance of the world over the acceptance of Christ. I am not ashamed to tell you the Truth. I will not tickle your ears. I love you and Jesus Christ too much to do that. Furthermore, you will be free! Fear of man will be gone! And you will enjoy the presence of God in your life, with joy unspeakable and peace that passes understanding. You will even consider it an honor to suffer for the Name of your Lord and Savior, Jesus Christ! On the other hand, if you have never made Jesus your Lord and Savior, I must unashamedly tell you that you will go to Hell. I realize it is politically offensive to say that, but it is the Truth. I’m not judging you. God has already made this judgment. The good news—the Gospel—is you don’t have to go to Hell! Jesus made a way for you to escape Hell by following Him. It is your decision. Will you go your way, which leads to Hell, or will you go His way, which leads to Heaven. If you believe Jesus Christ is the Son of God, who died on the cross to atone for your sin and to reconcile you to the Father so you don’t have to go to Hell, then publicly confess your faith in Him today. Repent of your sin and give Jesus your life by dying to yourself in baptism. Then you will be born again of the Holy Spirit, who will empower you to be a witness and an ambassador of Jesus Christ.